Writers avoid How To books for the same reasons people put off exercise…one more thing to do in an already packed schedule, causing pain to un-used muscles or stretching left during class when everyone else is leaning right. And naturally there’s that article, short story or novel that you’re trying to finish. Shouldn’t you try to produce something instead of simply stretching? I almost left Poemcrazy on the shelf because while I admire poetry, I don’t write it. Something about the book wouldn’t let me put it down. Maybe it was the subtitle, “Freeing your life with words”. 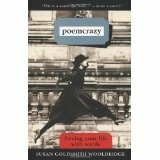 Poet and teacher, Susan Goldsmith Wooldridge is the friend who coaxes you off the coach and into your sneakers. Before you know it, you’ve walked two miles and don’t feel the slightest bit winded because the conversation was so interesting. You notice how the wind moves through the trees, how the sun illuminates the evening clouds, the way the quail hurry before launching into flight. And you can’t wait to get home and play with your new-found images. So if you’re feeling at loose ends creatively and the world seems flat, grab a notebook and a copy of Poemcrazy. You can always go running tomorrow.